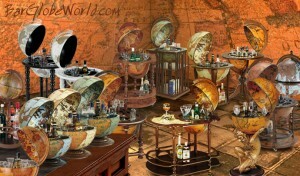 Happy Earth Day from Bar Globe World! Many people and websites will be wishing everybody a happy Earth Day, but what is that and how did it start? April 22 draws global attention to the importance of environmental protection (or it should). It is celebrated by more than 192 countries throughout the world. It was celebrated for the first time officially in 1970 in 2 thousand universities and colleges, more than 10 thousand elementary and middle schools, as well as hundreds of communities in the USA. Many individuals and environmental organizations hope that Earth Day will become a day that causes policy changes and influences human behavior towards the environment. We at Bar Globe World applaud the efforts of the coordinators, the nonprofit organization Earth Day Network. The chairman Denis Hayes, who actually organized the first Earth Day celebration in 1970, now claim that this day is the largest secular holiday in the world, celebrated by more than a billion people annually. And what better day to purchase a bar globe than this. Have a look at some of the new globe bars we have in our in the Design Collections by Zoffoli.